Apparently, there’s a couple of nice Golf courses in Quebec City. I wouldn’t know about that, since I don’t play golf. So yeah, I’m pretty sure Conroy has to be bored out of his mind. I would be. Yes, absolutely. 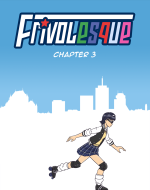 Today’s Frivolesque features two dudes talking about a girl we all know. You might remember those two from previous strips where they made brief appearances, but this is their first “starring” role. Will they ever become recurring characters?